Cardfight! Vanguard 16 – get crazy way! The first rule of card fight club is everyone has to have seriously spikey hair. Although I’m commenting here on episode 16, this is technically my first impression post about Cardfight! Vanguard. This episode kicks off the regional championship, so I thought it would be a good time to point out this show, which might have been overlooked due to its generic nature. As a result, rather than describing the episode itself, this is more of a general comment about the series as a whole. Stand up, vanguard! Cardfight! 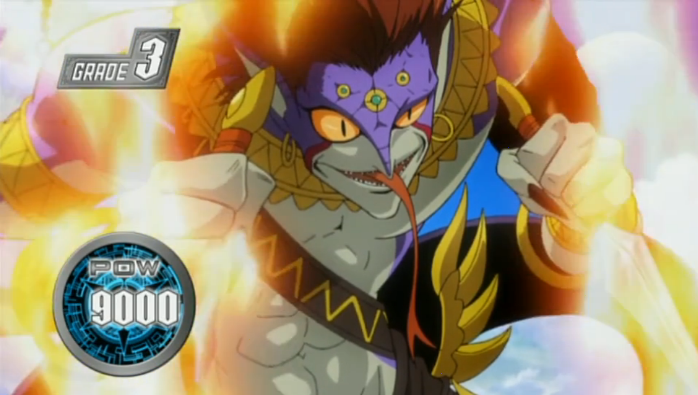 Vanguard is a fairly generic card fighting show. Basically, kids fight each other with decks of special cards that enable them to imagine they are fighting as various monsters and such. If you aren’t sure what I’m talking about, you can watch the OP (helpfully linked below) which gives a pretty good idea of what the show is like. Normally I’m not a fan of metal, but I have to say this song is decent, and has all of the stupid, intense energy you want in a situation like this. Lots of adrenalin, over-driven guitars, speed lines, fantasy elements, and attitude. A good chunk of each episode consists of battles with points, power-ups, and special moves. All the shounen fun you could want. Cardfight! Vanguard, like all shounen stories, is about getting stronger, and the quest to be number one. The main character starts as a bit of a wimp, but he grows by participating in the card fights at the local card shop. In the process, he makes various friends, and pursues his ambition of getting good enough to fight against the cool, older Vanguard player, Kai. Yes, to those familiar with the genre, there is nothing new here, and this is really the biggest weakness of the series. But, although it doesn’t shake up the genre, it is a very competent interpretation of it. For those who love lighter shounen fair, or those who have never watched a card fight show before, or even those looking to kill some time, with some crazy visuals and people getting all worked up over a card game, this is a fun watch. The Three Blacks. 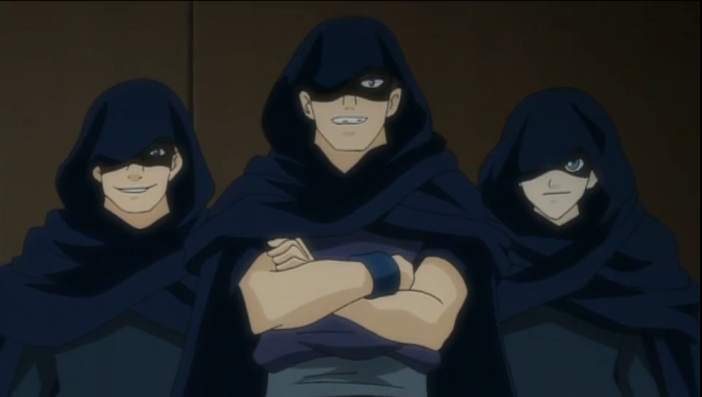 The road to the top of the Kanto Regional Championship goes through these dark magicians. The first season started somewhat informally, and all the action centered around the Card Capitol store, where all the cool kids go to buy booster packs and challenge each other to games. As the first course ended, things got more exciting, with a shop tournament. Episode 16 is the start of what promises to be a major new arc, with the winners of the shop tournament trying their luck at the regional Vanguard tournament. Given that the shop tournament was a very enjoyable arc, full of tense moments, and a dash of silliness, I am looking forward to seeing some exciting fights over the next few weeks. You can check them out for more information. 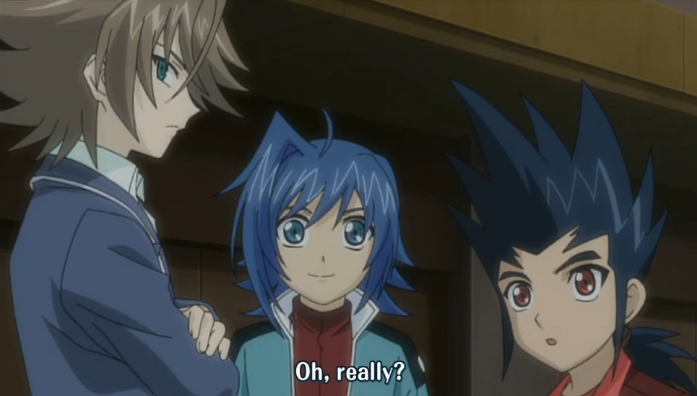 Comments Off on Cardfight! Vanguard 16 – get crazy way!